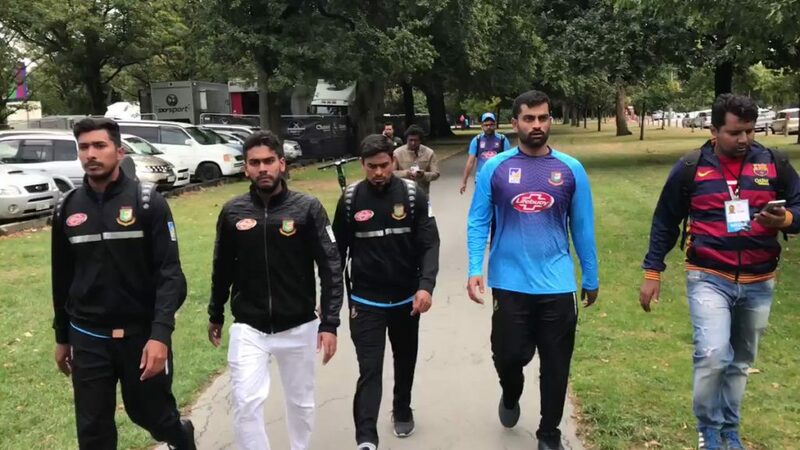 The Bangladesh team escaped from their bus after it had gone to a mosque near the Hagley Oval where police are responding to reports of shots fired in central Christchurch, reports banglanews24.com. Several minutes after they were barred from getting off the bus, the players escaped and ran through Hagley Park, reportscricinfo.com. Visibly shaken, the Bangladesh players even urged passers-by not to go any further on Deans Avenue. They made it back to Hagley Oval where they are currently locked down in their dressing room, as the manager Khaled Mashud is in contact with both NZC and the BCB. Much of the coaching staff was back in the team hotel while the head coach Steve Rhodes was at the ground. Liton Das and Nayeem Hasan were also back in the hotel and have been contacted, and told to stay back at the hotel. Bangladesh’s tour of New Zealand has been called off following an attack on a Christchurch mosque in which several people have been killed. The shooting happened just minutes away from Hagley Oval, where the test was set to be held, and the Bangladesh cricket team narrowly avoided the incident, having to flee the scene. The team had just arrived at the Al Noor Mosque for Friday prayer when a gunman opened fire, with video showing several Bangladeshi players and media escaping the scene. New Zealand Cricket CEO David White confirmed that the third test has been called off as a result of the attack. “On behalf of NZC – heartfelt condolences to those affected.